Conveyors are a critical part of warehousing operations, but there are many options, providers and variables. To help clear that up, we have created a quick download for your use. Let’s break down what you need to know beyond the obvious. There are specifications you’ll need to know. Don’t sweat it if you don’t—we can assist you with all of this. There are many options, and options within those options. If you aren’t sure what is needed, let us know and we can work with you to specify it. Usually this depends on your environment, load type/dimensions/weight, facility factors and other factors. How long does your conveyor need to be? Most types of conveyors can be fit to most any length, but there are potentially some limitations. Conveyors are measured by bed length and overall length. Typically you are more concerned with the amount of conveying surface (bed length) than facility size (overall length), but when space is tight all of this matters. Most conveyors’ overall length isn’t too much different than its bed length. If there are multiple conveyors, note the length you have available for each to get started. The width of your widest load. 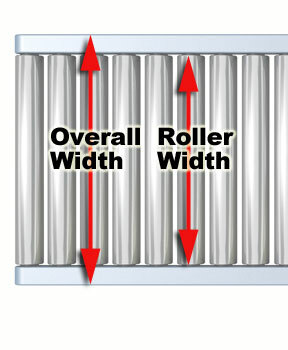 This dictates your roller/belt width so that your conveyor can accommodate the load. Some conveyor types let the load hang over the edges, if rollers are set high (above the frame so the load can hang over as it travels). Keep ergonomics in top-of-mind. For very wide conveyors, use skewed rollers or other means to guide product to the working side of the conveyor so that people don’t have to bend over to reach it. This will help with both ergonomics and safety. You don’t want people leaning needlessly across a running conveyor. When conveyors are mounted on the floor, you’ll need to set the height based on the way the conveyor is being used. If people are working on product, picking or packing on the conveyor, the primary driver should be ergonomic working height. Usually this means setting the height for a “golden zone” that lets people work easiest. This article breaks that situation down in detail, but it’s mostly about setting conveyors for “knuckle height”, with is 30″ from the floor to the center of the operator’s hands for the average person. Conveyor heights are defined as top-of-roller or top-of belt. The The height of the load should also be considered if people are working on the loads. You can set the conveyor lower if there is a 12″ tall load to make it easier for operators to work with the load. Take guards into consideration when setting the heights. For ceiling-mounted or overhead conveyors, there are different considerations. Usually people aren’t working on those, but you will need to set them to safe clearances for people or forklifts passing beneath, and be sure they interface correctly with processes on the floor, mezzanines, machinery, etc. Low profile conveyors, which typically have a conveyor bed height of less than 2″, can be used in tight vertical spaces. Belt conveyors move along a surface beneath the belt (plastic strips, metal slider pans or rollers), and are pulled along by a drive pulley that’s equal to the belt width. Belts can be specified to do most any job, and are particularly good for conveying boxes/cartons, irregular items, and more fragile loads that require more support than rollers. Bags or looser components are often conveyed on belts. Belts are the default conveyor type for incline conveyor applications. The type of belt depends on your application. “Everyday” general purpose belts are made from a variety of materials (Nylon, PVC, rubber, etc) and lots more. They are good for warehouse systems in predictable conditions. Some of these belts can be made in food-grade materials, others for high temperature applications, bulk/trash conveyors, accumulation systems, and as mentioned above, for incline/decline conveyors. Most belt conveyors you will see fall into the general purpose range. Plastic belts/chains are built for specific applications, such as medical/pharmaceutical, wet areas, packaging, sanitary areas, machine integrations, and food handling. Many of these systems can be washed down for clean applications. 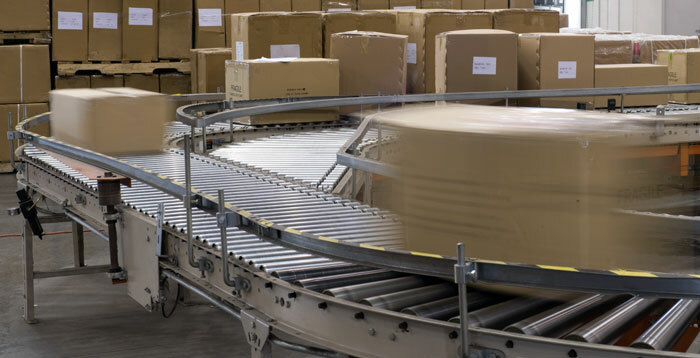 These types of conveyors are often specified as low profile (or “table top”) systems. They’re considered a lighter weight conveyor, but are very wear resistant and can fit into tighter spaces. See plastic chain conveyors for more details. Metal belts: These belt types are typically used in bulk, manufacturing, high-heat, washdown, stamping, and similar operations. They can be specified in hinge, woven wire, or flat belt configurations. Roller conveyors are used for general conveying applications. They are more demanding than belt systems are in terms of load quality—they usually can’t handle inconsistent, sagging, or damaged loads, as load irregularities will sag or tilt. Heavier items may bounce or roll. Rollers are ideal for diverts or package stops where “blades” can raise between a couple of rollers to stop or divert a load. This versatility is key at traffic points, where you often find roller systems. Rollers can be skewed to easily divert loads as well. Rollers can also be made in “bowtie” style to create a cradle to transport pipe, tubing or similar loads. Rollers are versatile in that you can also create very heavy-duty applications. Standard rollers are 1.9″ diameter, but you can get them in 2.5″, 3.5″, or even larger sizes to move extremely heavy loads in manufacturing or processing applications. Roller can increase or decrease the space between (called “roller spacing) to hold even more weight as needed. Usually a single item requires 3 rollers beneath it for smooth conveying, but more is sometimes needed, and rollers allow you to do that. How fast should the conveyor run? This is contingent on your facility needs and throughput, and will determine the motor size and other design considerations. 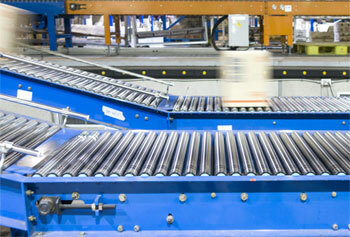 The default speed of most powered conveyors is 65 feet per minute, but that can be made faster or slower depending on your needs. See our conveyor speed calculation page for details. What motor do you need? As mentioned above, motor selection is usually driven by desired speed, but of course also by the type and weight of a conveyed load. Obviously, pallets and light cartons will have different requirements in terms of the power and number of drives it takes to move them. Standard conveyors come with a selection of motors, but many others are available. In some cases, you may need 24-volt conveyors, or motorized rollers, or standard drives. We can help walk you through that process. When you embark on a conveyor project, think about all the items that may be conveyed on the system. Sometimes it’s just a few, consistent loads (like totes). Other times, it is a wide variety of cartons, totes, components or other items. The main thing is that if you have varying loads, your conveyor must be configured to handle all of them. This in-depth article covers many variables for conveyor loads and types. When conveyor projects go bad, it is usually because the loads weren’t adequately understood. Sometimes people buy conveyors based solely on price, or without a full understanding of difficult load factors. If there are any doubts about the viability of a load, Hytrol runs a live testing facility. What’s being conveyed? A pallet, a carton, a bag, loose components, drums, pipe, tubing, bulk materials? As mentioned above, some types of loads are more suited to belts than rollers. Are we conveying a mix of these things? What are the load dimensions? How tall, how wide, how deep is the load? Will the conveyor be handling consistent sizes or a mix of them? How much does the load weigh? For the conveyor to run at necessary speeds, we’ll need to know how much each of the intended load items weigh. Other factors: If we are using vision to sense and move the load, we’ll often need to know the color of the totes you’re using. Anything you can tell us about the load will be useful. What’s the total live load? We’ll help you calculate this, but basically we need to understand how much weight will be on the conveyor at a given time, so we can ensure that its drive, supports and frame are up to the task. Throughput requirements: How quickly should your product travel through the system? How are you loading the conveyor? If there is shock loading, design considerations change. If you are placing items by hand, dispensing them from sorters, or lowering them from a hoist, let us know. Understanding loading methods help us design a better system. How will you use the conveyor? Will the line start/stop under full load? To allow that, the drives and motors will have to be designed for it. How many times will you start/stop it in a minute? 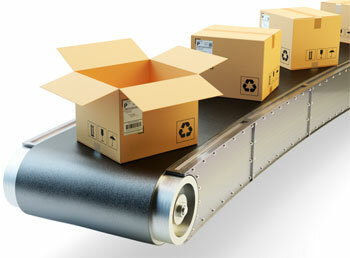 Will your conveyor need to be reversible (flow in both directions)? How many hours per day will it run? What is the environment around the conveyor? Are you using conveyor in a very hot or very cold environment? Is it moist or humid in the area? Is there a significant amount of dust and airborne debris? If there are any conditions that impact other machinery in your operation, those conditions are likely to affect conveyor. They can be dealt with, but we’ll need to know about them in detail. In general, any details you have about the load, the conditions around the conveyor, and the way you will use it will help you get the right system. There are plenty of questions, but it’s actually not as complex as it seems. Contact us and we can assist you with your application, simplify your decision and help you specify exactly the right conveyor.